This story is part of an ongoing Globe and Mail investigation into hundreds of missing and murdered indigenous women in Canada. Melissa Herman takes the usual precautions when she goes for an early-morning run along the Snye River. She wears a bright yellow shell and brings along her bounding dog, a high-energy mashup of husky and chocolate lab named Charlie. But then she takes a further step, calling her brother and telling him when she’s running and the route she’ll take, so that someone knows where she is. It’s not because Fort Mac is particularly unsafe, even in Ms. Herman’s downtown neighbourhood next to the infamous Syncrude Towers. Running through Snye Park is no more dangerous than going for a jog through one of Toronto’s leafy ravines. What troubles Ms. Herman, 28, is that, if she were actually to go missing or be murdered, she would be written off by the RCMP and by society as just another “high-risk” aboriginal woman. The possibility of going missing or being found dead is an ugly fact of life for aboriginal women. It happens at an alarming rate – an RCMP report in 2014 said that 1,017 aboriginal women were murdered and 164 went missing between 1980 and 2012. Aboriginal groups, including the Native Women’s Association of Canada, and several provinces have been calling on the federal government to launch a national inquiry. Earlier this month, the United Nations’ Committee on the Elimination of Discrimination against Women added its voice to that chorus. The Conservative government has refused. According to the RCMP, aboriginal women made up 16 per cent of the women murdered in Canada, vastly out of proportion with their 4-per-cent share of the country’s female population. The proportions are even more out of whack in Alberta. It was the province or territory with the highest number of murdered indigenous women in the report – 206. Indigenous women make up approximately 3.1 per cent of the provincial population, based on 2011 census data, and yet accounted for 28 per cent of the murdered women in Alberta from 1980-2012. In the most stark terms, if you are an aboriginal woman in Alberta, you are nearly 10 times more likely to be murdered than a non-aboriginal woman. Ms. Herman is the single mother of a 10-year-old girl. She studies aboriginal entrepreneurship at Keyano College in Fort McMurray and works full-time as a student assistant in the college’s development department. It’s a job that lets her take time off to attend her daughter’s science fairs and other school activities. She lives a busy life, sharing one of Fort Mac’s expensive rents with a friend. She and her daughter often return to Janvier, the native reserve about 90 minutes south of Fort McMurray where her mother was born, to see family and spend time in the bush. Ms. Herman’s life hasn’t always been this quiet, though. As a teen she was homeless, drinking, taking drugs and avoiding school. It was after her daughter was born that she started focusing on her education and work. Even after that, though, there were times she was employed but still had to sleep on a relative’s couch with her daughter because she couldn’t afford housing. It was always a struggle. “My thing is trying to present myself in a way where I would be respected and would have some value,” Ms. Herman says. “Because I don’t think there is any value. Even with what I feel like I’ve done – I’m educated, I’m well-rounded – I’ve still had people call me a ‘squaw.’ I’ve still had people tell me just the most ignorant thing where you’re just…” Her voice trails off. This has left the family and friends of victims convinced the Mounties see their missing daughters, wives and sisters as the authors of their own misfortune, and not a high priority. In Fort McMurray, if you meet an aboriginal man or woman in their 50s or 60s, there is a high likelihood that they were forced by Ottawa, with the help of the RCMP, into residential schools at ages as young as six. The disproportionate number of women and girls who’ve been murdered or gone missing in Alberta also means that everyone in the province’s aboriginal communities knows a victim or the family of one. Ms. Herman was friends with Amber Tuccaro, a 20-year-old woman from Fort Chipewyan who disappeared outside Edmonton in 2010 after travelling there from Fort McMurray – where she was living – with her son and a friend. Ms. Herman was a news reporter at a local radio station at the time and remembers thinking something was off about Ms. Tuccaro’s disappearance. She says she wanted to continue airing stories about Amber afterwards, but her news director felt it was old news. Ms. Tuccaro disappeared in August, 2010, and then in October so did Janice Desjarlais, a local homeless woman. The RCMP said it had video surveillance footage of Ms. Desjarlais and her boyfriend climbing into a dumpster in downtown Fort McMurray. They were looking for a place to sleep. In the morning, only the boyfriend is seen leaving, and then a garbage truck comes and empties the dumpster. The police did a nine-day search of the local landfill but found nothing. Janice Desjarlais, 35, simply disappeared. The boyfriend, who reported she was missing, was never a suspect. Two years and a month after Ms. Tuccaro disappeared, her case changed to a murder investigation when some of her remains were found in the woods near Leduc, Alta. The RCMP has since admitted that “initial elements of the investigation were mishandled” after her disappearance – an admission that came last year after Amber’s mother, Vivian Tuccaro, filed a complaint against the RCMP detachment in Leduc for failing to conduct a thorough investigation. Sgt. Hulm said that since Ms. Tuccaro’s disappearance, the Edmonton-based missing-persons unit has begun triaging new cases on a daily basis, rather than weekly. If the team spots anything unusual or in need of follow-up, it will contact the relevant RCMP detachment immediately. “I can’t say for sure, but if we’d had that kind of triage when Amber was missing it might not have gone where it did,” Sgt. Hulm said. It will be a long time before Ms. Herman has faith in the RCMP. And it’s a message she passes on to her daughter. “I want to make sure she knows that nobody is going to look out for her more than her. Don’t depend on the RCMP. Yes, you call them, but don’t put all your eggs in one basket. You can do whatever you want and they’re not going to protect you. Ever since her heart stopped, Rinelle Harper has been striving for normalcy. She fought for her life and now she wants to live like the 16-year-old she is – spending too much time on Facebook, listening to Eminem, playing volleyball, resisting her mother’s suggestions on how to wear her long black hair. It has been nearly five months since a beaten Rinelle crawled out of Winnipeg’s freezing Assiniboine River, only to be attacked again on a footpath by two men who left her there to die. Now she is giving a voice to the murdered and missing native women who are not able to speak for themselves. She wants a national inquiry into their deaths and disappearances, and she wants native women to take care of one another – to walk in pairs, especially at night. Hers is the quiet voice of a shy teen cast reluctantly into a public role by the ineffable luck of the survivor, but hoping to be heard all the same. During an interview at the Harper home in Winnipeg this week, Rinelle and her parents, Julie and Caesar Harper, reflected on life since the Nov. 8 attack and spoke of plans for the future. The rented home is in a residential neighbourhood near the Red River, the murky waterway where the body of Tina Fontaine, a Sagkeeng First Nation teen, was found in August of last year. It is a small house, never meant for so many. Rinelle and her older sister are home from boarding school more often now, and Mr. Harper, who had been working in their northern community of Garden Hill, Man., has moved to the city to be with his family. On the kitchen table there was a Bible and a Canadian Armed Forces application for the Bold Eagle summer military program in Alberta. Rinelle, who is contemplating a future in the Forces, hopes to be accepted to the summer program. Atop the TV in the living room stood a matted letter of support from Senator Lillian Dyck addressed to Rinelle. Framed family portraits, taken about a month after the attack, were also on display. The teen’s reticence is nothing new. “She’s the same girl,” her father said. In the interview, Rinelle communicated mostly through body language – nodding, shaking her head, smiling. She said little more than “yes” or “no,” though she sometimes turned to her mother and answered briefly in their native Oji-Cree. Rinelle was thrust into the spotlight because police and her parents made the rare, calculated decision to release her name in the hopes it would spur investigative leads. It did, and now two men have been charged in connection with the attack on her, as well as a separate assault on a 23-year-old woman hours later. The teen, who said she does not remember the attack and does not suffer from flashbacks, is relieved arrests were made in the case. She feels safer now. But at the same time, she wishes her identity had never been released. She finds it difficult to be the public face of a movement. And yet she understands this is her life now and she wants Canadians to hear her message. The day after The Globe and Mail visited her home, Rinelle – unsolicited – sent thoughts over Facebook. She said her family has been fortunate enough to be supported through their “healing journey.” They pray, go to church and are starting to talk about what happened to her. The attack was so horrific that Ms. Harper, who endured 45 minutes of CPR at the scene and had no pulse in the intensive care unit, was nearly the subject of a homicide investigation. In some ways, the months since have been surprisingly unremarkable. Rinelle sleeps well and no longer needs the sleeping pills she relied on in the hospital. The teen still boards during the week at Winnipeg’s Southeast Collegiate and is on track to finish Grade 11 with her friends, as long as she catches up in English class. She briefly returned to tae kwon do just two weeks after being released from the hospital. She missed basketball tryouts but made the volleyball team. The family sometimes orders KFC for dinner. They watch Castle and listen to rock on the radio. But life after the attack has also been surreal, emotional and frightening. In December, the recovering teen addressed the Assembly of First Nations clutching an eagle feather, just as her great-uncle, Elijah Harper, famously did in the Manitoba legislature when he stood up against the Meech Lake accord. She took her first trip outside the Prairie province in February to attend the national roundtable in Ottawa on violence against native women. Maybe, she said, she would like to live there some day. Rinelle, who two weeks ago started seeing a counsellor, makes sure she is never alone in Winnipeg at night. Still, her mother is anxious. Ms. Harper, who moved to the Manitoba capital last year to take college business courses, worries when her daughter is out. She also worries when the words “Private Caller” appear on her cellphone. She fears it is a relative of one of the co-accused. Justin Hudson, a 20-year-old Poplar River band member, and a 17-year-old male, who cannot be named because he is a minor, have been charged with attempted murder, aggravated sexual assault and, in relation to the attack on the 23-year-old, sexual assault with a weapon. She said the assault on her daughter and their time in Ottawa for the roundtable have opened her eyes to the wider issue of murdered and missing native women. Prime Minister Stephen Harper has dismissed calls for a national probe, saying the tragedies are not part of a “sociological phenomenon” and need not be further studied. Ms. Harper said she will be voting for the Liberals in the fall election because she thinks Justin Trudeau is a good leader and his party supports an inquiry. Her daughter, she said, is scarred from the attack, her legs especially. But other than having to change the dressing on a particular wound every couple of days, Rinelle has recovered. Gone is the bloodshot eye and the chest pain from the prolonged CPR. Gone, too, is the residual ache that coursed through her body. My mom and I have been getting a lot of support from people we meet. One thing that has been happening is that other women and girls have been approaching us to talk about how they were attacked. Many women told us that they never came forward and that they carried that with them, some for many years. I believe more women and men who have been assaulted should come forward. My family and I have been fortunate; we found support for our healing journey. We pray, go to church and we are beginning to talk about what happened to me. But there are so many people out there who need someone to talk to. Victim Services are hard to come by, especially if you don’t live in Winnipeg. I understand that conversations have been occurring all across the country about ending violence against indigenous women and girls. When I was at the AFN Assembly, I asked everyone to keep a few simple words in mind that have been my inspiration: love, kindness, respect and forgiveness. I also shared my support for a call for a national inquiry on missing and murdered indigenous women and girls. I am able to call out for an inquiry, but there are far too many young women who lost their lives who cannot do the same. For me, the inquiry would help women come forward and report the assaults that happened to them. The inquiry would be a chance for women and their families to heal from the past. I am thankful for my life – for the time I can spend with my family. I thank God for giving me this chance to say a few words to everyone who will listen to my message. Conrad Burns hopes more men will show support at missing and murdered Indigenous women events and help raise awareness towards the issue of abuse towards women. Lani Elliott was 21 years old when she survived a vicious attack by her husband, who beat her with a baseball bat and broke her leg. Elliott is now telling her story to First Nations and in schools, raising awareness of how often domestic abuse plays a role in the issue of missing and murdered indigenous women. "It's almost like people want to believe that a lot of the violence that's happening, the perpetrators are strangers, and maybe that's the case for some of them, but we can't ignore the fact that domestic violence, relationship violence is a huge contributing factor to these women going missing," Elliott said. Despite 89 per cent of the perpetrators being men, Elliott said a lot of men don't want to talk about the issue. She's had speeches cancelled last minute and male leaders sending female representatives instead. "It's sad to say but there's a lot of push back," Elliott said. "In my mind, it tells me this is an issue they don't want to talk about." Several organizations have agreed that not enough men are showing up to support women at missing and murdered indigenous women (MMIW) events. There are exceptions, however. Conrad Burns is helping set up a week-long event in Prince Albert to create awareness about abuse towards women. "Traditionally, women controlled the community. They were in charge," Burns said. "We've lost that. As a man, my role, traditionally, is to support a woman in any given single way possible ... women give birth to us. Women help us develop ourselves. Women feed us and clothe us, and pass on their knowledge, and take their time to care for us. And somewhere along that way some men think they become punching bags." Burns admitted it can be tough to get other men involved, because he said some of them would promise to take part in an event, but then they'd never show up. "Getting guys involved in Prince Albert, I know there's a lot of amazing guys out there, and they're all busy doing their own things, sometimes it's hard to focus on something else, because everyone's got their own struggles." Worse than not showing up are those who are opposed to the cause completely, such as a man who responded on Facebook when Burns posted that people need to respect women. "A man, I don't even know where he's from, stated right away, 'Just because you posted this I'm going to hit a woman today'." Despite the struggles to get his message across, Burns still believes that more men will join the cause. "Good men, healthy men, have got to step up and teach men what a healthy man is again," Burns said. "If men don't stand up, they're continuing to cycle. And the cycle of abuse is not good for anyone." Everything Brandy Maxie does now is to save her children from the rough adolescence she had. "I was victimized in ways I wouldn't wish upon my daughter, I wouldn't wish upon anybody else," she said. Maxie was 15 when she left her home. She said her parents worked tirelessly and tried to help everyone that needed it on the White Bear First Nation. They were entrepreneurs, took care of foster children in their home and served as support workers for suicide prevention on the reserve. "We had quite a few family members who committed suicide," Maxie said. When she chose to leave the reserve all those years ago, she said it was because it had all become too much. "I've experienced a lot of the on-reserve issues and a lot of it has to do with alcohol and drugs and violence and there are good things, I love the reserve, but I also saw a lot of the negative things that were happening." Maxie explained she was trying to escape the hopeless negativity of reserve life; but she left only to be swallowed up by a predatory city. "It was kind of my first experience with how the city life was," she said. "I was 15 and I am walking to school every day and walking to daycare to pick up my little cousins." She moved directly into Regina's North Central neighbourhood where she attended school. She said she felt scared most of the time and had to walk everywhere she went. "I had vehicles following me … I remember throwing sticks at a vehicle because it was trying to chase me and a friend down." Maxie said her teenage years were filled with tough trials. Good things happened; she met the father of her children and graduated from high school on time. Bad things happened, too. Maxie said at age 16 she was drugged and raped. When she regained consciousness, she was filled with fear. "When I woke up I was very dizzy and didn't know where I was. I made a break for the door," Maxie said. "It was unreported because I learned very fast I didn't want to be considered a rat, didn't want to be at the police station." Maxie said after she graduated Grade 12, she moved back to the reserve with a man she met. They had a child together in 2004. They named the baby girl Valyncia Spavier. It wouldn't be long before Maxie found herself back in North Central. She said, for a while, life back on her reserve was good. She and her partner had a daughter and a son together. A stable family life seemed possible. But, it didn't work out. Maxie moved herself and her two children back to Regina. She said she didn't want to give up on her dreams. She wanted to pursue post-secondary education. She wanted a car and a safe home for her two children. But the only places she could afford and the only people who would rent to her were in North Central. "There were people walking by drunk every day," Brandy said. "Sometimes with my kids, we'd walk to the park and no word of a lie someone followed every single time. They'd turn in to the alley. They'd make some kind of a signal. It was just too much for me." For a year her children lived with their father, back on the reserve, while Maxie went to school, looked for employment and couch-surfed. Maxie said although it hurt her heart, she had to get her children away from the area. During this time she said that not having a car made every trip out of whatever house she was calling home, scary. "I always felt unsafe. I didn't want my kids to be seeing a lot of that," Maxie said. Maxie's break came in the form of a job interview in Saskatoon. The chance at a new life came just in time, after years of living in fear in Regina, unable to escape what she called the "hood." She was afraid her dreams would die there. "I just kind started feeling hopeless," she said. "Like, I can't get a decent paying job. I can't do this. I can't do that. When you're living poor, people treat you pretty bad, especially if you're an indigenous woman. They really do." Maxie said it was a long journey that lead her to Saskatoon. She won her way through First Nations' entrepreneurial competitions. She explained that she often wore sweatshirts to the presentations because she was too poor to buy a blazer. "Me, walking to a business planning competition and somebody yells 'how much?' or tries to stop me," she said "They're not driving by and thinking 'oh no, she looks like she's trying to do good in her life, I'm going to leave her alone'. Physically my appearance, I look like what they would stereotype as a prostitute." Now Maxie lives on Saskatoon's east side in a modest duplex with her three children. She is working hard to make her dreams of franchising her own fitness company a reality. Her two sons, ages six and eight, both have health challenges. Her eldest and only daughter, 11-year-old Valyncia, is always by her side. Maxie said she vividly remembers the first time her daughter, Valyncia Sparvier, understood the danger she faced because she is aboriginal. Maxie was at an outdoor fitness class at a school in Regina. Her three children were playing nearby at the school's park. A man in a red truck pulled up and parked near the children. She said she watched in terror as the man tried to lure her young daughter to the car. "Valyncia, she is so protective, so she immediately grabbed her brothers and went closer to the school building and was calling for me," she said. "We had the discussion; sometimes people will follow you because you are a native girl." Maxie said as her daughter grew older, she began to ask questions about what it meant to be a "missing or murdered indigenous woman." She was honest and told her daughter about the women they knew who were missing. Maxie's cousin Danita Bigeagle went missing almost 10 years ago in Regina. And five-year-old Tamra Keepness, who disappeared in Regina in 2004, was also from their home reserve, White Bear First Nation. "Your physical appearance, just being native, is going to put you at a higher risk for certain things than a non-First Nations person and that's just the way it is right now," Maxie said of her conversation with Valyncia. This year, Sparvier wrote an award-winning speech about the issue of missing and murdered indigenous women. Initially she chose the topic for her Grade 6 public speaking assignment. Now, the pre-teen is speaking at events across the province, aimed at raising awareness about the issue. Maxie said she believes it is important that her daughter learns to have her own voice, but she does not want her to live in fear. "I have lived in fear. I have been a victim. I don't identify with it anymore but a lot of my parenting comes from my past experiences." In her speech, Sparvier speaks about the need for women, especially First Nations', to have self-defence skills. "I think we should take self-defence courses so that's what I have been doing for a while," Sparvier says of her weekly boxing lessons at Nelson Boxing Club. "If any of them almost get abducted, or something like that, it's good that they know self-defence so that they can protect themselves," the girl said of her peers, who she speaks to about the issue. Maxie said she is proud of her daughter's strength and feels with a little more hard work, they`ll be able to achieve their goal: to live comfortably and go to Disneyland. "I told the kids 'I've got to work really, really hard and we're barely going to scrape by, but I will always find a way. But, one day were going to be totally fine. I just want to live comfortably." Now, Maxie is thankful that she no longer lives in a mouldy house in North Central. However, her older van is in need of repair and things still get tight at the end of the month. Despite this, Maxie is determined to raise strong children who will learn to fight like she did for a brighter future. "It's the first time where we're really feeling hopeful." Deloria Many Grey Horses-Violich 33 lives in Calgary, Alberta, Canada. She is a proud member of the Kainai Nation – a band of the Blackfoot Confederacy – the Chickasaw and the Yankton Sioux Nations. Deloria is an urban First Nation’s woman dedicated to creating change and advocating for Indigenous Rights through her writing, film, photography, and all other forms of self-expression. Deloria studied at the University of California, Berkeley and double majored in Native American Studies and Ethnic Studies. Her mom is a residential school survivor and so Deloria has experienced the first hand statistics of First Nations people. She describes herself as a contemporary warrior who uses her passion for equality, words, images, and storytelling to combat the history of injustices for the Canadian Indigenous communities. Deloria’s goal is to one day create a different story for Indigenous peoples – a story that will overflow the forces of humility, courage and compassion! What motivated you to deal with the subject of Missing and Murdered Indigenous Women and Girls (#MMIW) in your poetry? I represent the generations of Indigenous women who have come before us and those that will come after me. I am the mother of the earth, sister of justice, aunty of peace, and girlfriend of reason. I are the backbone of my community. In my heart is where I live. 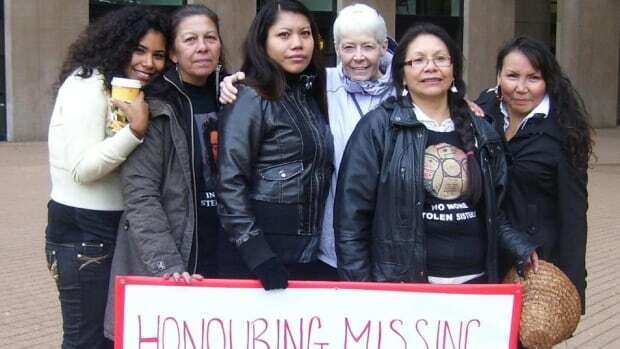 Contemporary warriors wanting justice for daughters and sisters gone missing. Over 1200 missing and murdered Indigenous women. Each with a family and loved ones. Each left with a broken heart. Does my brown skin and appearance make us less? Let’s move towards our strengths. We need to educate ourselves to win the battle. Education is the new buffalo. Each word I read creates change. Each time I speak up creates awareness. Why have you chosen the medium of poetry? It seems like violence has always been part of Lorelei Williams' life. The DNA of her cousin Tanya Holyk was found on serial killer Robert Pickton's farm, Williams' aunt Belinda Williams has been missing for years, and Williams herself grew up in a household where she suffered sexual and physical abuse. Williams says it wasn't until she was older that she understood the root of the violence she suffered at the hands of her mother. "I found out she was in residential school, and that's what she grew up with, and being a child, taken away from her mom when she was six-years-old," Williams told CBC's The Early Edition. "When she was taken, [she was] counting the mountains to find her way home, and then having to go through the sexual abuse, child abuse, physical abuse in residential school..."
Even though she had a traumatic childhood, Williams says her experience has made her stronger, and it drives her to give her two children a better childhood than her own. Williams is also an advocate for missing and murdered aboriginal women, and has even founded a dance troupe called Butterflies in Spirit to raise awareness. "Just thinking of having other women with me to do the dance was the original idea — to get my missing aunt's picture out there. "But also to remember and honour my cousin Tanya Holyk, not … thinking that other family members of missing and murdered indigenous women and girls would join me. "And that made it so much more strong, and we healed together doing this, and we're still doing it." She was just a teen when her entire world changed the day her mother was murdered. What follows is how an Apache woman decided to transform her life from a cycle of trauma, to action earning a masters degree at an Ivy League to work for social justice for indigenous people. It was around 11:00 a.m. on a school day and Noel Altaha sat in math class, joking with her classmates in Apache. She was living with her grandparents apart from her mother at the time, and she loved going to school. “In those years I could just be a kid, like everyone else,” she said. She could never anticipate how her life was about to change. The principal called her into the office. There, she saw her aunt sobbing as her uncle sat quietly. “What I’m about to tell you is serious and I need you to listen carefully,” her uncle explained to Altaha, then only 13-years-old. Her mother, Jade Velasquez, was found murdered near a camper in Phoenix, hours away from their Arizona home. And this was not an isolated incident. It turned out that she was killed by a man who had raped and murdered four other women. Recently, Altaha, now 27, talked about the incident in an interview in a quiet corner of a Columbia University library. Softly lit lamps glowed behind her as she sat in a leather chair mentally retracing that life-changing conversation. It appeared to be as exhausting as living through it. She felt her hands become clammy, and a hot sensation course through her head. “It was almost an out of body experience,” Altaha recalled. Her voice quiet and shaky, she continued: “The rest of the year is a blur. It’s as if my head blacked out.” She gently moved strands of her waist length brown hair away from her face with hands decorated in silver and turquoise rings. Speaking about it conjured up painful memories. In those days after her mother’s death, Altaha continued attending school to try to maintain normalcy. But as the family held traditional Apache ceremonies, they left out a major process in their culture. Usually, the family of the deceased burns all of the persons belongings as a way of letting them go, sometimes even including pictures. Her mother’s clothes were, instead, held for crime scene investigations. The family grieved her life in traditional Apache ceremonies, and the girls cut their hair for one year. But they didn’t feel the mourning process was complete. “That was very hard going through the motions, partly because her clothes were withheld from us,” Altaha said. She was also confronted with media coverage of the murders. 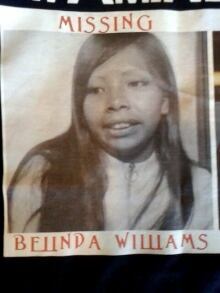 Various newspapers including the New York Times and local Phoenix publications reported about the murdered women. One of the victims was reported to be mentally disabled, and three of the women were confirmed to be prostitutes. Cory Morris, the murderer, declined psychological evaluations prior to the trial, according to court reports. Gossip spread throughout her hometown, and some of her classmates said her mother was a crack head, according to Jan Tenijieth, her mother’s sister. She decided to send Altaha to a boarding school in Portland, Oregon. Grieving the loss of her mother was an even harder transition because Altaha had to figure out how to face the effects of abuse. “I coped with the former child neglect by just checking out and not let anything anyone would say get internalized,” she said. Altaha’s experience was unique from her family members. Keyana Ayers, her younger sister, was 6-years-old at the time of the murder. Today, she is raising two toddler boys mostly as a single mother. Ayers rarely talks about her mother and their past of domestic violence. Instead, she quietly followed the investigation of her mother’s death. But that changed recently. “It brings back too many painful memories. It’s just not good for my well-being anymore,” she said. But their aunt, Tanijieth, has followed the investigation closely since the day she learned of her sister’s murder. Tenijieth continues to receive letters from the state attorney's office regarding the appeals being processed by Morris. She is still trying to collect Jade’s clothing from the state evidence room. And when the children were left without a mother or consistent father, Altaha’s grandfather, Amyx Seymour, stepped into the father role for the girls. But the family would rarely discuss her death, or the domestic violence the girls experienced. As an adult, Altaha grappled with how to make sense of the murder. She enrolled in college at age 18, but her studies were interrupted when she took over guardianship of her sister after her grandmother passed away. It was during this time that she experienced survivor anger for her mother’s death, she said. Years later when she returned to college, Altaha decided to turn resentment into action. She took courses that helped her to articulate what she had experienced growing up in domestic violence, and started going to therapy. She began to understand how her mother’s murder had affected her, she said. She also became involved with student groups that gave her a sense of belonging on campus. She is now a graduate student at the Columbia University School of Social Work in New York City. She plans to pursue a PhD program to be a researcher, professor, and a tribal consultant. One of her goals is to raise awareness for missing and murdered indigenous women through blogging, academic research, and poetry. She talks about domestic violence and murder, in hopes of helping her sister’s, and other indigenous survivors of violence, move forward. “Having those uncomfortable conversations with my sisters about what they were going through when my mom died is most important to really recognizing that healing from this is a lifelong process,” Altaha explained. “How can we teach self-compassion to the Native youth, or adults suffering from addiction?” she questioned. 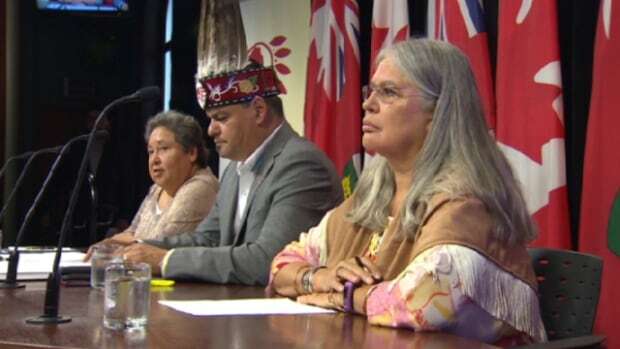 Ontario First Nations will launch their own inquiry into missing and murdered women and girls, saying the issue is too important to wait for the outcome of the upcoming federal election. 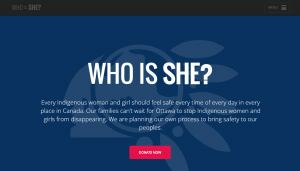 To pay for the inquiry, Chiefs of Ontario — a group representing 163 communities — has launched a website called Who Is She where the public can make donations. The site also features photographs of the missing and murdered, as well as messages from their families. "Every indigenous woman and girl should feel safe in this country," said Denise Stonefish, deputy grand chief of the Association of Iroquois and Allied Indians, which is aligned with Chiefs of Ontario. "First Nations families cannot wait for Ottawa to stop indigenous women and girls from disappearing." Both the federal Liberals and New Democrats have vowed to launch a public inquiry if elected, something the Conservative government has refused to do. Ontario Premier Kathleen Wynne applauded the Ontario Chiefs for starting the "Who Is She" campaign. "I think that it is laudable that they are going to be doing a campaign here in Ontario," Wynne said. "I will continue to raise my voice in the call for a national inquiry." It isn't known how many of the missing and murdered are from that province, but Isadore Day, head of Chiefs of Ontario, says the organization has been working with the Ontario Provincial Police and the attorney general's office to find out. Day says an inquiry would not replace a national public inquiry commissioned by the federal government. "Canada must be held accountable for its inaction on this issue," he said. "It's a wonderful time to get the message out there, don't you think," Day said of the federal election. "If we were to wait until the election campaign was over we would be remiss — we would have missed a good opportunity." The staggeringly high numbers of missing and murdered aboriginal women has drawn world attention. A 2015 United Nations report found that young aboriginal women are five times more likely to die under violent circumstances, as compared with their non-aboriginal counterparts. Last year, the RCMP released a report that said there were 1,181 cases of missing and murdered aboriginal women between 1980 and 2012. Earlier this year, the force updated those numbers and said an additional 32 aboriginal women have been slain and 11 more have disappeared since 2013. There is no dollar figure set for the fundraising campaign, and Day acknowledged that public inquiries can be very expensive, but said that wasn't the chiefs' main concern. "The urgency of this matter is one that has prompted us to not look at the total cost of an inquiry," he said. "What we're proposing here is we're going to do whatever we can, within our might, with the goodwill of our partners, to establish the beginning phases of that inquiry." On a typically grey winter day in Vancouver, Fay Blaney is walking through the heart of the Downtown Eastside with several other Indigenous women’s advocates. The women enter the Aboriginal Front Door Society where they’re about to hold a press conference to outline their concerns about the federal government’s recently launched inquiry into Canada’s epidemic of missing and murdered Indigenous women (MMIW). All of them have been fighting for this inquiry for many years, before the story of serial killer Robert Pickton preying on women in the area began making headlines, and before the general public began paying attention. They’ve been the ones talking to and laughing and crying with the victims and their families. Twenty-five years ago, Blaney and others were fighting for the rights of Indigenous women when the government just “didn’t care,” she said. Back then, Aboriginal women who died on the Downtown Eastside would get ten-minute funerals, if any, despite cultural protocol calling for days-long ceremonies to say goodbye. The issue is now getting increased attention and the MMIW inquiry is happening, but the committee is worried that the government isn’t putting enough focus on the misogyny and colonialism at the root of the problem. And they’re going to tell Indigenous Affairs Minister Carolyn Bennett exactly that, right after they tell the media. Blaney, her long hair in braids, warmly greets several regulars who are sitting in a circle of folding chairs drinking coffee from Styrofoam cups. People around her hustle to rearrange the room to make space for news reporters, who have already started arriving. She sits at a newly moved table, her voice and demeanour unshakable even after multiple interruptions from the centre’s staff and a CTV reporter who’s wondering where to place her microphone. Blaney’s daughter brings her tea and toast. “They’re expecting me to help organize this,” Blaney explains calmly as she sips her tea and directs the room between questions. Her steadfast manner is a product of, and has led to, her three decades as a powerful voice for Indigenous women. It’s been a lifelong journey for Blaney, whose first true act of rebellion happened when, still dealing with a history of violence and sexual abuse within her family, she ran away from residential school in Mission, BC. Blaney pinpoints her start in activism to when she was part of an all-women’s occupation of the BC offices of the Department of Indian Affairs to protest actions of its leadership in the early 1980s. She went on to study at Simon Fraser University in the early 1990s, another part of her liberation, and became a strong voice for Indigenous women in the years following as part of a number of different organizations and groups. In the early 2000s, she took her advocacy home to Homalco First Nation where she grew up, as documented in the 2006 documentary Finding Dawn. Before colonization, the Homalco people lived around Church House and Bute Inlet. They were healthy and fish were abundant. But the community was transplanted to an area far from the sea near the Campbell River airport. It was land-locked with no access to the ocean. The nation continues to mourn its loss. There have been serious residual impacts, and the resulting problems made it a scary place at times when Blaney was a child. The community has faced extreme social issues including, notoriously, physical and sexual violence towards its women, something Blaney watched happen to her mother who ran away to escape the abuse. But Blaney, no longer afraid, came into her community with guns blazing, ready to tackle the problem with other abuse survivors within the community. Despite their noble efforts, Blaney says now, ten years later, abuse towards women is still a problem that Homalco and many other communities continue to grapple with. Studies peg the rate of Indigenous women who have experienced violence within their own communities as high as 90 per cent. She sees women from her home community in Vancouver every so often, she said, through her work with the Downtown Eastside Women’s Centre. Blaney is an uplifting presence to other Aboriginal women not only because she can relate to their struggles, but because she also uses her culture to guide her work. When she was a young teen, she went through puberty rights, which involved bathing in a river every day for a year and cooking for her community. “I served the elders, I served the community, so those teachings have been invaluable and gave me a discipline that I could not have attained otherwise,” she said. By now, the small room is near-full of TV crews, reporters from many of the major news outlets and several Downtown Eastside residents who are gathering at the windows to see what all the action is about. Her fellow committee members are beside her at the table, a cluster of microphones now in front of them, and cameras begin to flash. Blaney looks apologetic, but everyone is looking at her expectantly. There’s a fire behind her eyes as she gets ready to speak, articulate and strong words that come from years of education and experience, but more than that, a real thirst for change. When asked how she feels that none of this, the inquiry, the interest, would be happening without people like her, she stays humble, choosing to acknowledge those who came before her. For Blaney, it’s not a choice, it’s what she’s always done — standing up for her sisters. The CTV reporter who’s been waiting hurries up to the table and turns on her microphone. Ontario will host the fifth National Aboriginal Women’s Summit in the fall of 2016. NORTHUMBERLAND -- An Aboriginal woman in Canada is three times more likely to be murdered than her non-Aboriginal counterparts. The Statistics Canada number is not unfamiliar to Samantha Cunningham, a child and youth counsellor with Anishnaabe Kwewag Gamig Inc. Regional Women’s Shelter in Alderville. Ms. Cunningham is working on her master’s degree in Indigenous studies at Trent University. She hopes a new Ontario government strategy aimed at reducing violence against Indigenous women is a step in the right direction. “It is long overdue,” said Ms. Cunningham. Walking Together: Ontario’s Long-Term Strategy to End Violence Against Indigenous Women was released in February. The strategy incorporates a number of the Truth and Reconciliation Commission of Canada’s Calls to Action. The government has committed $100 million over three years to support implementation of the strategy, which it developed in collaboration with Indigenous partners of Ontario’s joint working group on violence against Aboriginal women. Collaboration is key when considering policies to prevent violence against Indigenous women, said Ms. Cunningham. The reasons why Indigenous women are more likely to experience violence are complex, she said. The legacies of colonization such as the residential schools and the 60’s scoop, socio-economic conditions like poverty, and sexism, racism and discrimination have all played roles in the breakdown of families for Aboriginal peoples, according to the You Are Not Alone toolkit from the Native Women’s Association of Canada. The 60’s scoop refers to the practice of removing Aboriginal children from their communities through adoption without the knowledge or consent of families and bands. Wanda McIvor, Anishnaabe Kwewag Gamig Inc., executive director, said she was one of those children adopted at age 10 to a non-Aboriginal family after her parents died. She returned to her home community of Alderville First Nation 20 years ago and noticed how the community was starting to get back in touch with its traditional roots. People now participate in traditional ceremonies and sweats. There is a misconception that Indigenous people live on reserves when, in fact, the majority live in urban areas, said Ms. Cunningham. Indigenous women experience a higher level of violence whether they live on or off a reserve, she added. “It’s a bigger problem than just one community ... it’s a country-wide issue,” she said. As a regional shelter, Anishnaabe Kwewag Gamig Inc. serves women and children from outside Alderville. Ms. McIvor said approximately 70 to 80 per cent are not from Alderville and many women choose to stay outside their community. Whether or not the women have Indigenous roots, the shelter offers traditional teachings as a way to heal, said Ms. McIvor. The teachings, such as the Medicine Wheel, give women a way to look at the whole self -- physical, mental, spiritual and emotional, she said. The teachings help build self-esteem, she added. Looking at ways to resolve violence against Indigenous women, Ms. Cunningham said educating the public, offering positive role models, reclaiming traditional teachings and including Indigenous history in school curriculums at a larger scale are important. The shelter collaborates with other aboriginal shelters in sharing information on best approaches, said Ms. McIvor. • Improved data and research to guide the partners in developing new programs and policies that fit the needs of Indigenous communities. • Aboriginal women 15 years and older are three to five times more likely to experience violence than non-Aboriginal women. • Rates of spousal assault against Aboriginal women are more than three times higher than those against non-Aboriginal women. • 54 per cent of Aboriginal women reported severe forms of family violence, such as being beaten, being choked, having a gun or knife used against them, or being sexually assaulted, versus 37 per cent of non-Aboriginal women. Declaration presented by AWAN Members Cherry Smiley & Fay Blaney at Women's Worlds 2011, July 6, 2011. Premier Wade MacLauchlan speaks with some of the people who attended the Sisters in Spirit Vigil in Charlottetown on Tuesday, held to honour the lives of murdered and missing aboriginal women in Canada. The premier told the crowd the province will be inviting the national inquiry to come to P.E.I. to hear from the Island’s First Nation’s people. MacLauchlan is the first P.E.I. premier to attend the Sisters in Spirit Vigil in the 11 years it has been held in Charlottetown, according to an organizer. For Melissa Peter-Paul, Tuesday was a day of support. The member of the Abegweit First Nation was one of about 300 people who attended the Sisters in Spirit National Day of Vigils event at Confederation Landing Park in Charlottetown on Tuesday. “I want to be here in support of family and friends that have women or family members who have gone missing,’’ Peter-Paul said. The event was one of hundreds of similar vigils that took place across the country, organized by the Native Women’s Association of Canada (NWAC). The NWAC has gathered and catalogued information about 582 cases of missing and murdered aboriginal women and girls, with the oldest dating back to 1944, although most of them have been much more recent. It also says there are likely many more cases to catalogue. Of the cases, the NWAC has documented, 67 per cent are murder cases, 20 per cent are cases of missing women or girls, four per cent have been ruled a suspicious death and nine per cent are cases where the nature of the case is unknown. This is the 11th year a vigil for missing and murdered aboriginal women has been held in Charlottetown. Clark said more people are coming forward now that the inquiry is happening. Clark was happy to see Premier Wade MacLauchlan attend (she said it’s the first time a premier has attended the Charlottetown vigil) and tell the crowd the province will be inviting the commission to come to P.E.I. and talk to the provinces First Nations people.